Josh Behrens had no idea he dressed like Tom Cruise’s character in Cocktail; he’d never seen the movie. ecognize this guy? 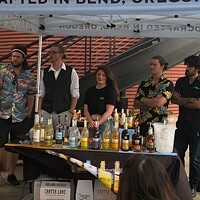 He's Josh Behrens, named the best bartender in Bend, crowned at the Bartender's Brawl finale at the Bite of Bend. To earn his title, he had to woo the judges with six different cocktails at two separate events. Behrens has worked around the bar since he was 19. He started as a bar back doing jobs such as stocking the bar with ice, glassware or prepping garnishes. He did this until he turned 21 when he could start legally working as a bartender. His training was in Northern California, where he grew up, from an old school bartender. He refers to the training as "old school" because the cocktails weren't craft, driven by obscure ingredients or Pre-Prohibition style classics. ehrens' first introduction to competition came on the job, where the house bartenders competed against each other to see whose drink would end up on the menu. This is where Behrens picked up his first win. 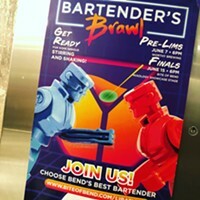 His entry round of the Bartender's Brawl was at J-Dub Restaurant & Bar. He was allowed to bring a few ingredients of his own, so he brought his homemade Irish Cream, using it in the competition to make a dessert cocktail (recipe below) with Irish Cream, crème de cacao, vodka and mint, with a rim of ground cocoa and hazelnuts. This cocktail earned him second place. (The bartender representing J-Dub was the winner.) Ultimately, the judges decided to push Behrens forward to the finale because it was such a close match. ehrens says cocktails are only as good as the ingredients—so he started making his own ice. Believe it or not, good ice is challenging. It can pick up flavors or smells depending on where it is stored. The wrong shape can melt too quickly, diluting a drink. Behrens boiled water to remove impurities and over the course of a few weeks stockpiled artisan ice for the finale. He also researched what was in season and what products the Pacific Northwest is known for. In addition to his artisan ice, he brought fresh mandarin juice, fresh pear juice (90 percent of pears in the U.S. come from the Northwest) and his house-made Irish Cream to the competition. The first challenge in the finale was to create a Smash (a cocktail with a spirit, herb, sweetener and muddled fresh fruit served over crushed ice). Behrens hand-crushed ice at home, in addition to the perfect ice. The next round was to create a cocktail with mystery ingredients—cloves—and RAFT smoked tea vanilla syrup. Josh used his pear puree with Rye and the mystery ingredients to mix up yet another winning cocktail. In the last challenge, Behrens had to satisfy the requests coming from a judge playing a picky customer, shouting that they weren't sure what they wanted but they wanted it to be citrusy and sweet. Luckily the mandarins Josh brought satisfied the "sweet and citrus" request and earned him the Bite of Bend's "Best Bartender in Bend" title. If you want Behrens to make you a drink, you can find him behind the bar at Worthy Brewing. Wish him luck when you see him; he'll be competing again soon—representing Bend—at the Bite of Oregon in Portland in early September. Rim glass with ground cocoa powder and hazelnuts. Combine all ingredients with ice and shake. Then double strain mixture into a glass and serve neat (no ice). Place mint leaf on top and sprinkle a little ground cocoa powder and hazelnuts over the mint.